The most-powerful production Jaguar will be launched at the Goodwood Festival of Speed 2017. The 600PS XE SV Project 8 will be limited to just 300 examples and be powered by a supercharged 5.0-litre V8 petrol engine. In recent weeks, the bonkers XE has been spotted testing at Germany's Nurburgring Nordschleife track, albeit in camouflage paintwork. The production-ready XE SV Project 8 is expected to go on sale in the summer, although the majority are expected to be snapped up by collectors, which means they'll be sold out long before they reach showrooms. Specs and prices are yet to be announced, but expect the XE SV Project 8 to start northwards of £65,000. It will be hand built in Coventry and be capable of covering 0-62mph in under four seconds. The top speed will exceed 155mph. The XE will feature a special makeover by Jaguar Land Rover's Special Vehicle Operations (SVO) division, which was also responsible for building the F-Type SVR. Like the F-Type, the XE will be offered with all-wheel drive and powered by a supercharged V8, albeit with 25PS more power than the two-seater sports car. As well as a monstrous V8, the XE gets the full exterior racing kit, with lowered racing suspension, aerodynamic skirting and a huge rear spoiler. John Edwards, managing director of Jaguar Land Rover Special Operations team has billed it as “the most extreme performance road car in the history of Jaguar”. 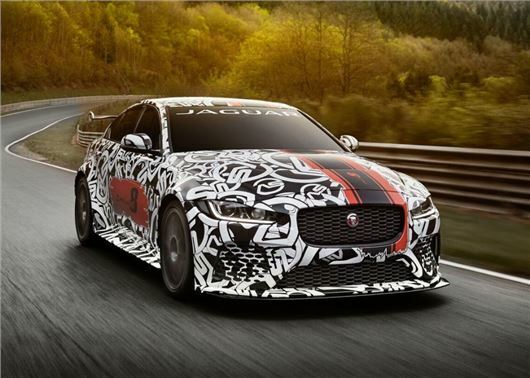 Full specifications for the Jaguar XE SV Project 8 will be revealed at its world debut at Goodwood Festival of Speed in West Sussex on 30 June.